Indian ethnic clothing has forever been appreciated the world over for its simplicity and designs. It has gained immense popularity since it is known to be the traditional wedding attire for brides and grooms. Most popular of all the Indian ethnic clothing is the Indo-Western Sherwani that is in demand for every occasion, from formal to informal and everything in between. Indo-Western Sherwani is a fusion of the South Asian ethnic wear and the Western fashion. With the world becoming a global village, the merging of the traditional attire with the western one is inevitable. 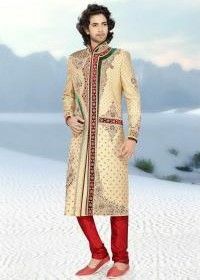 Indo-Western Sherwani showcases the modern and trendy look along with preserving the traditional and native avatar. This trendy attire is made up of a traditional Kurta and Churidar but has a design and style that is very modern and classy. 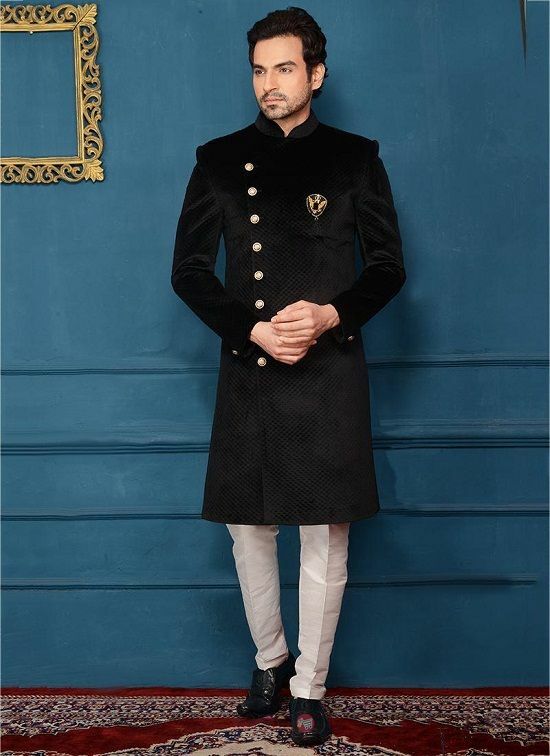 This look differs from the ethnic Sherwani in terms of the design and sleeve length, shirt length, and neckline patterns. 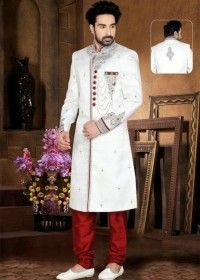 The conventional Sherwani originated as a fusion of the infamous British Frock Coat and the Salwar Kameez. It is a long coat-like garment similar to a doublet or an Achkan and is often associated with the Muslim tradition. Men belonging to the royal and noble families wore Sherwanis as a symbol of pride and honor. In countries like Pakistan, and Bangladesh in South-Asia, Sherwanis are worn by men in almost all occasions and gatherings, and in India, it is considered to be the perfect attire apt to be worn on formal occasions, especially in the winter season in the North and North-Eastern parts of the sub-continent. These Sherwanis were stitched using premium fabric and had simple and elegant work done on them. Contemporary Sherwanis, on the other hand, have a rich fabric and fancy designs and embroidery work on them that make them extremely royal and graceful in look. How to wear an Indo-Western Outfit with Panache? While indo-western wear can stand on its own as an exquisite piece of clothing, how one wears it makes a remarkable difference as well. Styling it right and making it look as appealing and spectacular as one can depends on the kind of fabrics used, the choice of bottoms one wears, the cut and the patterns on the outfit, and the accessories flaunted along with. When and where the outfit is worn is another aspect of dressing right that matters if you want to leave a lasting impression. 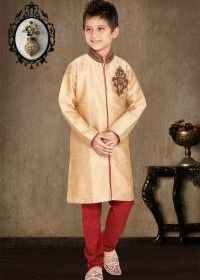 Indo-Western Sherwani unlike traditional Sherwani is an outfit that is worn over modern bottoms and not over a simple churidar. What defines ‘modern’ here is that the churidar differs in pattern and style, for example, one amazing pattern is wherein it is often narrow at the ankle with some gatherings and is baggy above the knee level. Other patterns include dhoti-style lowers or a straight-fit trouser-like churidar. Accessories make for an important addition to your ethnic look, no matter where you intend to flaunt the outfit. Whether you wear dhoti as part of your indo-western wear or a pajama, such combinations of the Indo-Western Sherwani look best when they are accessorized with a stole or a dupatta of a matching color and with traditionally designed mojaris. Another things that makes a huge difference in how your outfit is sure to look when you flaunt it is what occasion you intend to wear it to. If it is a wedding, opting for fabrics that are grander in comparison with heavy embellishments are the right choice. On the other hand, choosing something simple and elegant can make you look dashing and suave as you walk into the venue. The ideal season to flaunt the right outfit is another question to keep in mind when you are adding to your ethnic collection or shopping for an upcoming event where traditional outfits are a mandate. If the event is being held in the warmer months, selecting fabrics that are sure to be comfortable in the heat are an ideal purchase to make. For the colder months or seasons, choosing materials and cuts that ensure you stay warm even while you flaunt the best styles can help you make a better impression. The Indo Western Sherwanis that originated a couple of years ago are considered to be one of the most demanded Indian ethnic men’s attire today as they are a perfect blend of Indian traditional clothes and the modern western style. With diverse fabrics, designs, and colors, this men’s outfit is the apt attire for the modern-day youth and men as it offers the best of both worlds. Designer Indo-Western Sherwani clearly reflects the intricate traditional style Kurta and Sherwani with the contemporary style churidar and makes them an ideal outfit to be worn by men who think global while being local. Finding the right kind of Indian or indo-western outfit is hardly easy when you have a ton of options to choose from. But knowing where you can get the most fabulous range to cater to your needs is the solution to all your ethnic wear needs. 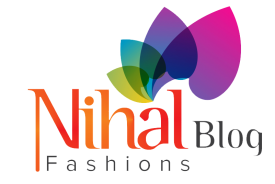 As an online shopping portal, Nihal Fashions has managed to make an impression among people across the globe by offering the best ethnic Indian wear at the most affordable prices. 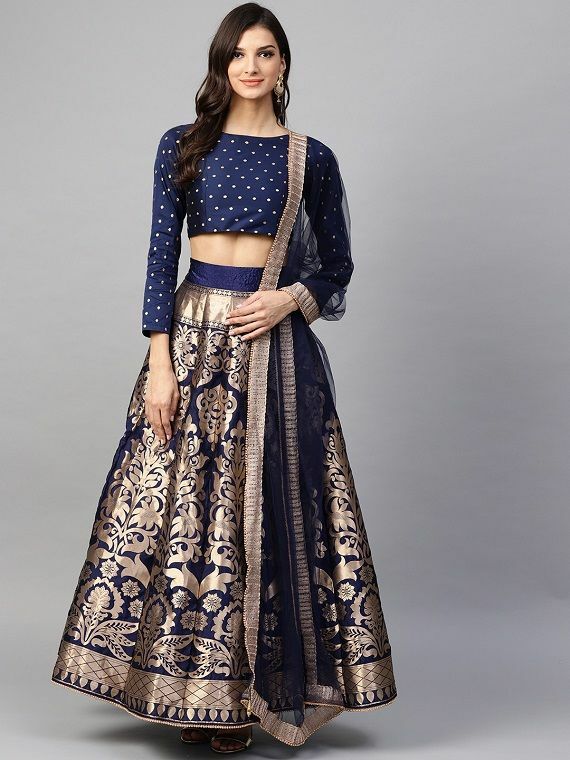 With the number of options available online, this online shopping store is definitely worth spending a few precious minutes in where you are bound to find the most amazing ethnic wear selection that are curated using the finest of fabrics and embellishments that are a class apart. You can choose the kind of fabrics you wish for, the specifications that suit you best, as well as the accessories to go with it without even leaving the comfort of your home while you’re at it. 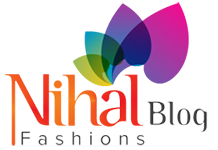 And the deals and discounts are certainly a great boon to boot with the affordable range in which you can avail your choice of indo-western outfit.